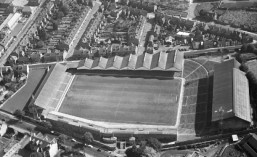 Formed in 1926 as Aldershot Town but dropped ‘Town’ in 1932. They were members of the Football League from 1932 to 1992, when they went out of business. Wolves faced Aldershot in only four League matches and completed the double twice. Aldershot surprisingly beat Wolves in the 1986 Fourth Division promotion play-offs. The first meeting between the clubs came in May 1952 in Alf Rogers Testimonial match which saw the Shot’s run out winners 5-2. The club reformed as Aldershot Town in 1992. David Barnes, Phil Bauld, Andy Beattie, George Berry, Chic Brodie, Bob Brown, Steve Claridge, Billy Crook, Stan Cullis, Fred Deakin, Tommy Galley, Bobby Gould, Jimmy Jinks, Andy King, Tony Lange, Tommy Langley, Bertie Lutterloch, Jimmy Melia, David Miller, Sammy Moore, George Mordue, Alf Somerfield, Alan Steen, Frank Taylor, Horance Wright.